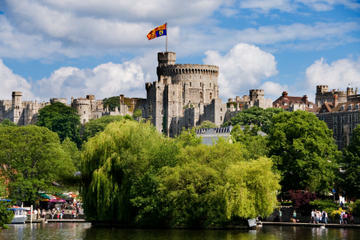 Leave London in an air-conditioned bus and head west towards Windsor, home of Windsor Castle, the official residence of Queen Elizabeth II. Covering 13 acres, this imposing castle houses luxurious royal apartments, the Queen Mary's Doll House and the magnificent St George's Chapel, the burial place of King Henry VIII. Upon arrival, show your pre-booked ticket or pay the ticket price (depending on which option you've selected), and head inside to see the royal apartments, St George's Chapel and other highlights, which will come to life with an audioguide narration. The staging of the British pomp at the change of guard takes place in the Castle grounds almost daily, so you can enjoy this colourful morning ceremony before the excursion if it takes place on one of those days and if you have purchased your Castle ticket. If you prefer, you can spend your time exploring the city of Windsor Castle and strolling through its picturesque streets. You can also see the Old or New Guard marching to the Castle if the excursion coincides with a Changing of the Guard ceremony. The ceremony is usually accompanied by a military band: the guards march through the centre of Windsor in shimmering red robes and iconic bearskin helmets. An impressive spectacle. After approximately two hours in Windsor, you will head towards Stonehenge. This UNESCO World Heritage circular monument stands majestically from Salisbury Plain and is shrouded in mystery. You can buy a ticket from your guide and take an audio tour that delves into the spiritual importance of this megalithic structure and its associations with characters such as King Arthur and Merlin. You can also explore Stonehenge on your own: from the outside and meditate on its mysteries while taking photos of this incredible prehistoric monument. Later, you will continue on to Oxford. The honey-coloured stone faculties of Britain's oldest university inspired students such as Lewis Carroll or J R R Tolkien. Take a walking tour of Christchurch College, the Bodleian Library and the Sheldonian Theatre as you listen with extreme clarity to the comments through the Vox headphones. He will then return to London. The tour will end at the Victoria bus station. Gates 1-5, Victoria Coach Station, central London. Hotel pick-up service available at some hotels in central London. Stops to pick up travelers at their hotels begin before this time. You should contact your local service provider to find out the exact time they stop at your hotel. The tour ends at Victoria Coach Station in central London.